The problem set up by Hartwick,and. Olewiler (1998) (chapter 3) is for a landlord to maximise rent from wheat production at a homogenous land area. 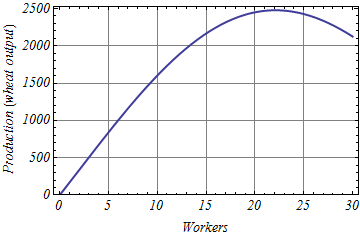 Assume the total production to be as in the figure to the right.The total production is increasing at a diminishing rate until a maximum production is reached at a use of labour a little above 20 workers. Why does the production reach a peak? Or rather: Why may the production decreases with an increased number of workers from this point? 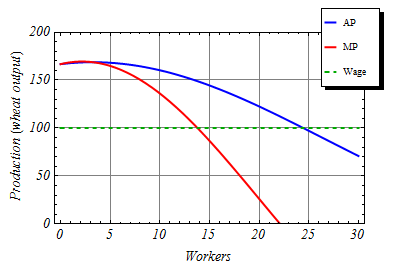 The average production is the production per worker, shown in the figure to the right. Assume that the production is measured in terms of value and that the unit price of harvest is constant. Assume further a wage of 100. How many workers should the landlord employ? 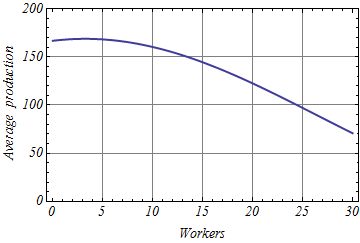 The figure to the right shows the average production (AP), marginal production (MP) and the wage per worker. With an employment of 24 workers all the income from the production has been used to pay the workers, while 14 workers generate a profit of 2100. Is this profit rent? Not necessarily. Economic rent is the profit which exceeds the normal level of profit (normal profit).